Welcome back the sweet scent of freedom. Breath in the greeheen! BRANT BJORK has come to revive your spirit: The KYUSS- and FU MANCHU legend has just announced his first live record ever! From the opening guitar riff of Europe '16, recorded in Berlin, one can sense the buzz of classic rock electricity that transcends into new spheres. This is controlled madness between trippy and doomy, groovy and sludgy! 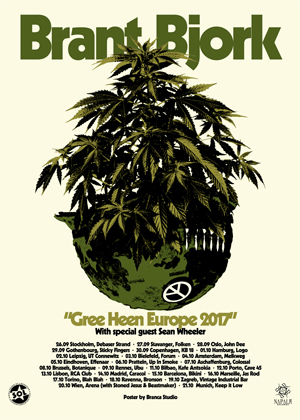 Set for release September 22nd on Napalm Records, BRANT BJORK has now revealed the cover artwork and track list of his first live record. "This record is live. Live records are ugly and they should be. When a band plays live, they let their hair down. Live is all that really matters. There are those moments in life when everything is ok and these are the moments when you are doing exactly what your here on the planet to do. You're right where you are supposed to be with no shame, no fear, no regret, no envy, no hatred and no apology. I always say this band brings a feeling. The feeling is always primary and the sound, secondary. At least to me. In the book of Tao, there is a passage..."naming is the origin of all particular things". I use here the term ugly to refer to my naming of my particular relationship with my soundscape. my my my. Why the term ugly? Because its the opposite of pretty. As the popular saying goes, "It is what it is". As for my music, my band and this live record, I prefer to say, "it is what it isn't"." 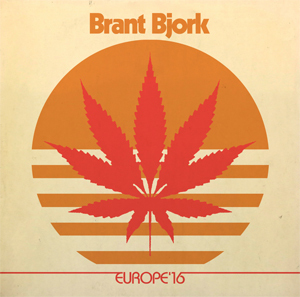 - Brant Bjork on Europe '16. "Let The Truth Be Known-Jumpin' Jack Flash"
Whenever BRANT BJORK turns on his fuzz pedals on stage, you can always count on him, as he delivers lush Stoner Rock with balls of steel, winged by vivid guitar solos and his creaking whiskey tinged voice. His psychedelic melodies raise to huge groove monsters. The air feels dry from the dust; the inner eye witnesses the setting sun morphing the desert sand into a glowing sea. Europe '16 lives from exquisite Desert Rock grade A. Live and pure!